The creation of this breed with its varieties is owed to the talent and scientific accuracy of Professor Alessandro Ghigi. During the decade 1920-1930, when he was Director of the Stazione Sperimentale di Pollicoltura in Rovigo, Professor Ghigi studied the hereditary behaviour of certain opposite characters such as the cerebral or cranial hernia in Padua's - which implies the growth of a large crest - in concomitance with the peculiar shape of comb and nostrils. The hereditary behaviour of these features was researched and compared to the transmission of the corresponding characters in common chicken breeds. Professor Ghigi was furthermore interested in the genetic information concerning weight and size in such specimens (Arduin M., 1991). 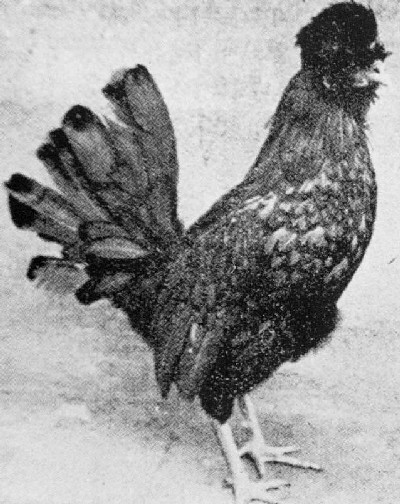 The first strain he created was the black one, by means of crossing Bantams with crested Paduas and subsequently selecting small-sized specimens with a large crest. The selection brought a strain with beard and muffling, and one without these characters. Both sexes were green-shaded black, with primitive comb, well visible white earlobes, slate-blue shanks; weight between 500 and 550 grams, with a strong tendency to hatch and raise their offspring. These animals strongly resembled the Bantam type. 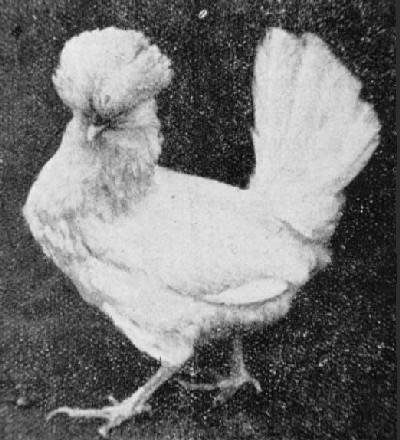 The next step was the creation of the white strain by means of white Paduas, to be followed by the “Ancona” (mottled) strain by crossing the white and black ones, and finally the “Dorata” (Gold-laced) and “Argento” (Silver-laced) types by means of crossing tuffled chickens with Sebrights (Brunoli A., 1972). Today, the Ciuffina Ghigi has become totally extinct. Besides, the existence of Paduas in a Bantam version makes it unnecessary to retrieve the Ciuffina, since the two breeds would objectively display several similarities. However, the Ciuffina Ghigi is still a noticeable example of an ornamental breed, and repeatedly conferred Professor Ghigi international recognition and appreciation. The wings are sloping to the ground. The feathers of the tail are well developed. Earlobes are big and white. A crest of feathers on the head is typical. There are two different varieties: bearded and not bearded.